Growing up in a small city in Michigan, I often felt like the only writer for 100 miles in any direction. I was interested in writing, but I had no idea how to get started or who to talk to about it. Not even my friends who were bookworms seemed excited about creating their own stories. I remember sitting at the kitchen table after my parents fell asleep and watching moonlight transform the colors in the poplar trees outside. Even small breezes set the leaves shimmying, and they made an excited paper sound that filled our quiet house. It all seemed very important, and I wanted to write something important about it. Struggling to find those words left me frustrated, but I figured that that was how I was supposed to feel because writers needed to suffer for their art. I have since learned that, in my sleepy Michigan hometown, many of my classmates were also aspiring writers who thought that loneliness was part of the job. It turns out that feeling is pretty common. Even in metropolitan areas with vibrant literary communities, like Nashville, young writers often feel like they are the only poet or novelist for 100 miles. Well, that stinks, so we are doing something about it. 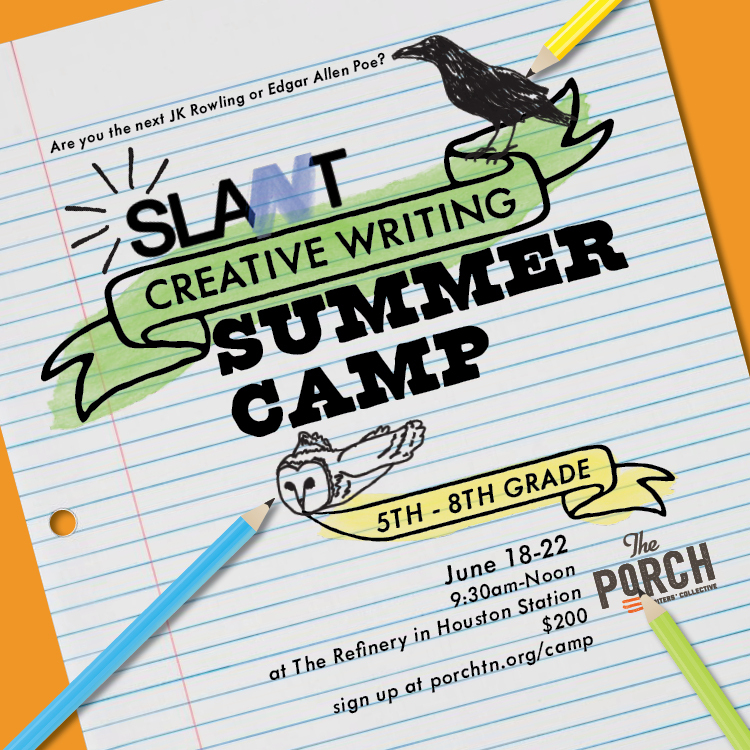 This June, in addition to our monthly programs for high school students, SLANT is hosting a creative writing summer camp for aspiring writers in grades 5 – 8. Over the course of five days, campers will get to explore the fun side of writing in a room full of peers who share their interests. Established local authors will help campers learn key elements of writing poetry and fiction, as well as provide creative prompts to help the words start flowing fast. There will even be a song writing day with a special guest instructor. Campers will write hard, have fun, and discover the joy of being part of a writing community. I still occasionally try to find words that seem important, but I’ve noticed a curious phenomenon: the poems and stories that resonate most strongly with readers (also the ones most often accepted for publication) are the ones that I had fun writing. It’s true: having fun with your work is not only conducive to happiness, it can help you become a better writer. Help us make the “lonely writer” a thing of the past by spreading the word. Do you know an aspiring writer in grades 5 – 8? Perhaps a young person who always has their nose buried in a book, or who won’t leave home without their journal? Share this post with them, and send them our way!